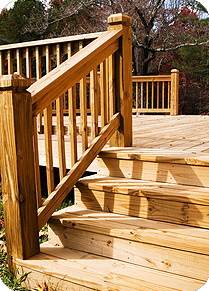 Adding a deck, porch or sunroom to your home is an ideal way to expand your outdoor living and entertaining space. Energy efficient features, including climate-controlled glass and skylights, can transform a screened porch into a four season room, giving you maximum flexibility throughout the year. From design to finish, One Way will work with you to create a beautiful space that enhances your home and outdoor enjoyment. One Way's designs include simple and highly functional decks, porches with historically accurate hand-turned columns and rails, and luxurious sunrooms with hot tubs. We use superior materials and fine craftsmanship to build a space that’s aesthetically pleasing and structurally sound for years of enjoyment. We’ll finish your customized residential porch, sunroom or multi-level deck with the highest quality paints and stains to keep it attractive and long-lasting. Talk to One Way about tailoring an outdoor space to your home and lifestyle.